We know each another when we were invited to be on the blogger panel at VON several years ago. Om, now has a blogging empire, in all business and tech (not just VoIP). I haven’t see any innovation in VoIP for a while. Sure, there are some new VoIP gadgets, a new Skype phone, some new businesses rehashing a business model with a twist. But there aren’t any ground breaking disruptive technology or business model for the last two years. Skype has done excellently initially but growth has slowed down since acquired by eBay. Despite doing fantastic well for the founders, I believe the acquisition is bad for the industry. Since then, Skype has not innovate much but has being focus on monetization. There is nothing wrong with the switch from innovation to monetization – all companies need to do that at some stage – but it swing so far that Skype has stop gaining any new customers in significant numbers. In other words, it grows rapidly through the innovators, early adopters, early majority but never really got to the late majority. We have Vonage that suppose to bring VoIP to every home. It was exciting as it is a glimpse of what the future might be. But alas, poor execution, lawsuits brings it downs to the knee. Not only the lawsuits brings Vonage down, it also setback the entire VoIP industry for at least a couple of years as investor shy away from VoIP. Truphone (or the Singapore version Pfingo) provides an interesting twist to Vonage by bringing the concept to the mobile phone. But this won’t fly until you have seamless wifi coverage. That is an heavy investment few willing to take on. Jajah was one of the more interesting VoIP players. It is growing rapidly but I see this as a niche technology, stuck in the hands of the innovator and early adopters until they figure out a way to make it easy for the mass consumer. PhoneGnome is an interesting hardware play. It was an idea David and myself talks about several years ago, except he went on doing it and I didn’t. It could potentially reach every household with its simplicity. But as in all hardware play, distribution is the key and until that got sorted out, it wouldn’t move in any significant numbers. OOMA which is a very pretty version of PhoneGnome just launch and it remains to be seen how well they do. Most of them are old companies which we see several years ago. There is nothing really new and exciting. So what’s there to blog about? Perhaps the setback from Vonage drys up any investment into VoIP. Perhaps people really stop thinking about VoIP. But I believe in VoIP. It is the future of voice; I cannot see us going back to SS7 and circuit switching. So I refused to believe this is the end of the VoIP innovation. I am still eagerly waiting for someone to come along to surprise all of us. +65-31050266 is the working VoIP number that will call my PC or my handphone. I had AT&T Callvantage a few years ago so I have a US VoIP number for a while. But this is the my first +65 Singapore VoIP number :-) While its not exactly what I dream of (“I hope to see shops in Sim Lim selling voice service packed in a box too!”), I am still very excited over it. Thanks to the folks at Pfingo which is currently under closed beta. Anyway, I just got it up and running so I cant say much about it yet beyond it is some sort of integrated VoIP, IM and Email PC&Phone service. More about it after I got sometime to play with it. This petition by Skype is one of the most significant milestone for the VoIP, or mobile application, industry. It will decide if the wall-garden cellular network will stay or go. phone carriers who “limit subscribers’ right to run software communications applications of their choosing” (read: Skype software). Skype wants the agency to more stringently apply the famous 1968 Carterfone decision that allowed consumers to hook any device up to the phone network, so long as it did not harm the network. In Skype’s eyes, that means allowing any software or applications to run on any devices that access the network. It stands on good ground based on the precedence of Caterfone in 1968 but law aside, politics is will likely to be involve. Afterall, you can expect cellular operators to fight it to the end. Just bought these babies…couldnt wait to blog about them. They are the standalone wifi skype phones from SMC and Netgear. Yep, standalone, ie no need for PC to work. In other words, I can use them in any hotspot. Yeah!! Original I thought Netgear and SMC are from the same manufacturer as reported in Gimozo but apparently I was wrong. But for those interested, the SMC (and Belkin) version are made by Accton, a taiwanese OEM manufacturer who made these phones in their Shenzhen factory. I wonder who made these Netgear phones. First impression is the Netgear is better. It is slightly smaller, heavier and feel more like a mobile phone. The SMC/Accton version feel a bit “plastic” (“cheaper”). It is old news and reported several times. I want to mention it because it is really ironical that I am sitting in Funan, the IT hub in Singapore and, get this, I can’t get any wifi access. Nope, not even those paid ones I have from Starhub or Singtel. Zip, zero wifi network I can hook up. I tried in all the different spots in Funan and nothing. In the end, I have to use my 3G phone to post this :P So much for “wifi in Singapore”. In KL, at least I know I can get reliable wifi access in any Starbuck. Whining aside, the significant of “free wireless net access” and the “wifi skype phone” is not lost to me. However, given that whoever roll out this “free wireless net access” is likely one of the current operators, I am willing to bet that they will be doing their best to stop this happening. It could be as simple as implementing some very seldom used wireless authentication (e.g. EAP-LEAP) or worst, requiring some special authentication software to be downloaded to your PC before you can use the network. 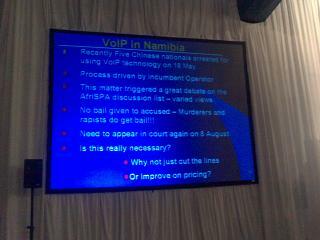 Was listening to Ferdinand Tjombe talking about VoIP in Namibia. Recently (12th May), five Chinese nationals was arrested in Namibia for using “VoIP technology”. The process was driven by incumbent operator. The interesting part is that the Chinese nationals was not given bail (when murderers and rapists does!). 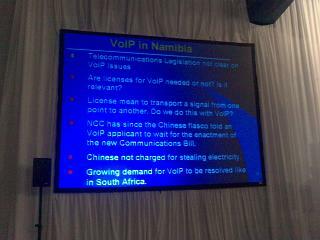 The telecommunication legislation in Nambia was clear on VoIP issues actually. Shortly after this, a company tried to apply for a VoIP license and was asked to wait by the regulator for the enactment of the new Communications Bill. I havent wrote about VoIP for a while so let me try here. I suppose I could write about the Vonage, about them being sued over E911, sued for patents infrigement, sued by shareholders and the fact their share price dropped by half since IPO. The latter was kind of embarrassing for me as I just gave a glowing outlook on VoIP market sentiments to some investment bankers using Vonage as an example not so long ago. Anyway, all these bad news are already covered by others so let me write about something else, like VoIP players in Malaysia. 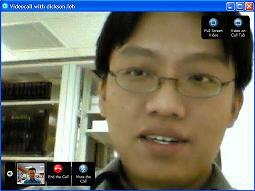 VoIP (long distance) players in Malaysia are dying. Actually it is kind of old news but since it is not widely known, so let me share the story here. The first sign of trouble was AIMS (a neutral data center operator) discovered they are losing customers, up to 2-3 VoIP companies per month! There was cries for help from the industry but it took a while for the regulator to figure out whats was the problem. I dont claim to have a full picture but this is what I know: It related to the VoIP service offered by one of the incumbent. There is nothing wrong for the incumbent to offer VoIP service. Neither was it a problem that the incumbent offers it cheaper than the other VoIP players. However, it is a problem that they engaged in predatory pricing strategy, offered the VoIP cheaper than the interconnection rate the other VoIP players have the pay them. It is also a problem to engage in price discrimination, offering the the service only and only for customers of their competitors. They literally take the “Don’ts” section of Antitrust laws and offer it as a service plan. Anyway, the regulator already step in and stop the service. The incumbent reacted by “white labeling” the service with a third party. 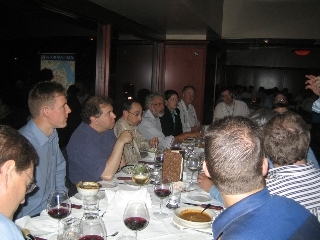 Things are a bit stable right now but in the long run, all but the largest VoIP players (e.g. Redtone) are in a very precarious position. * Best ever call quality. * One-to-one video conversations with anyone, anywhere in the world. * Contact list grouping â€“ organize your Skype contacts anyway you like by creating groups for ‘colleagues’, ‘friends’ and ‘family’,etc. * Mood message and local time display – so your contacts know where you’re at and how you feel. * Improved web presence through Skype buttons – display your Skype status on your blog or webpage. Many people have complaint about the FCC lately. Jeff Pulver during the blogger panel said he rather see FTC incharge instead. This is a big contrast compared to just barely a year ago where Michael Powell was a keynote speaker. In fact, there wasnâ€™t even a town hall session this VON. Where is the love from FCC? We all know that FCC is a highly political. Given the Republican is in charge, it is not unexpected that FCC would favor big incumbents. The series of decisions made by FCC over the last year has been so. But I believe what FCC is doing to VoIP industry is going to hurt America business interest in the long run. FCC policy decisions not only affects United States. It has implications to all who has business interest (whether buying from or selling to) with United States. More importantly, regulators around the world often compare notes and FCC is always one of few regulators look up to. Lobbyists often quote FCC especially when it echo what they are asking for. At this moment, when everyone around the world is struggling with VoIP regulations, the recent FCC policy decisions on VoIP like 911, emergency calls, lack of interconnection settlement framework, etc etc, is going to tickled down to the rest of the world. Very bad news for all those who is trying create a positive environment for VoIP to flourish. But how is this going to hurt American interest in the long run? Remember United State is a trading nation â€“ any thing that favors free trade, opening up market (especially other country markets) is good. What FCC is doing right now is going to come back and haunt American companies later when they expand overseas. I didnâ€™t have the chance to take a shot at the â€œChina storyâ€ but we have many other interesting discussion like what will shape the VoIP industry in the next two years â€“ more start-ups, more mega buyouts, more innovative applications and more regulations. The last is mine and Jeff jump at it the moment I said the word “regulation”. Oh yes, David Isenberg joined us for dinner. I was sitting at the other corner with David, Tom, Aswath. I spent most of my time at the Communication Policy Summit. The most exciting session got to be Lawful Intercept session, with speakers from Drug Enforcement Administration and Federal Bureau of Investigation explaining why they need CALEA and they did a great job. Unfortunately for them, their opponents John Morris and Brad Templeton did an even better job. In short, no one deny the law enforcement agencies the right to do legal intercept but the objection is how it is implemented. As it is current proposed, it is trying to retro fit a new technology into an old model, making technical requirements like 0.2s timestamp that increases the cost of implementation without any explaination why it is needed, and most importantly, why the industry should spend millions/billions of dollars to implement which is incomplete and easy to circumvent (it does not deal with IP-to-IP so all the terroist needs to know is www.skype.com). The other session I enjoy is session on policy reformation. The two hour session is extremely informative covering topics like (1) inter-state/carrier settlement (2) universal access fund (3) VoIP jurisdiction. For (1), it looks like US Congress don’t really know what they want but they want FCC to solve it. Conclusion is that it is not going to be resolved anytime soon. For (2), the issues seem simpler, or at least California Commissioner Susan Kennedy thinks it can be resolve easily by associating the contributions with phone numbers. The debate is more of a re-definition of what is “universal access” as no one wants to use the money to build an old copper infrastructure especially if you can get broadband IP infrastructure for cheaper cost. (As it stands, the universal services is bias towards copper network). For (3), Susan surprised me by saying she supported FCC to have jurisdiction over VoIP instead of the PUCs. In her words, “take it away from us before we hurt ourselves”. Well, I disagreed so we had a little discussion. Her final statement surprised me but it also explained a question I had for a while: after FCC waive the “right-of-way” for new fiber laid, how are they going to balance the market? Where is the wedges they can use on the fiber operators? Susan: For them, we have universal access funds. In other words, the universal access funds are being used to create competitions (she confirmed this after the session). Everything makes senses now: Using universal access funds to create competitions at the same time deregulating the “right of way” (The government should avoid regulating a monopoly in the hopes of making it “The Good Monopoly”. Instead, devote resources to promote competition and abundance. see Lessons learnt from history). But shouldn’t it be called “Universal Competition Funds” then?